in 3 rows sc, 1 row hdc; rep 4 times. Now available as a PDF in US Terms, with closeup photos and schematic included. 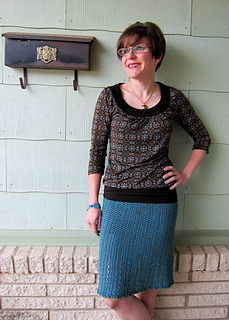 Plus, suggestions on adapting the skirt to your needs--this skirt is easy to size to any waist measurement! Tips for altering the length and waist measurement are included. This classic skirt pattern is worked side to side, making it easy to customize to any waist measurement. A simple four row repeat includes a touch of lace detailing that’s worked at the hem, and a zipper makes it easy to put on (but instructions for an elastic waist are also included). The layered two-color edging adds a bit of whimsy, or leave it off and let the lace of your favorite slip peek through.